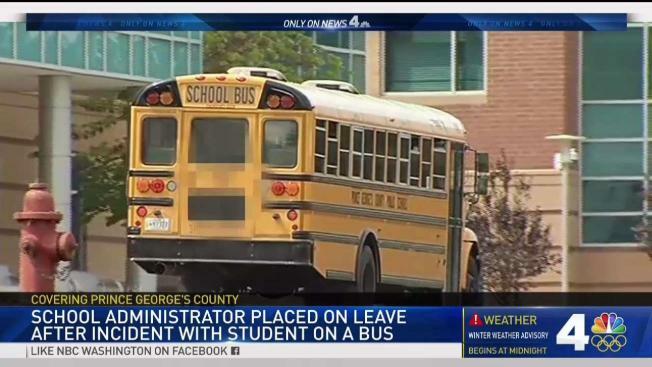 An administrator for Prince George's County Public Schools is on administrative leave after he was accused of chasing a student and grabbing her after she allegedly threw garbage out of a school bus window and it hit his car. "We expect all of our administrators to behave professionally, which is why we're investigating," PGCPS spokesman John White said. Fossett did not respond to an inquiry. Once the bus got to the school, Fossett got on board and yelled at the students, the source said. A security guard asked Fossett for identification. Then, the teen who allegedly littered got so upset she jumped out of the back of the bus and started running to the school. In a letter sent to parents on Friday, Principal Byonka Gregory said there was "an incident" that caused students to be late to their first class, and the bus was delayed on Pennsylvania Avenue and again at the school. Gregory gave no details in the letter about the incident.